6.0 Vegistroke owners help needed. I need input on diesel fuel pressure on 6.0 trucks with Vegistroke kits installed. What I am looking for is what your DIESEL fuel pressure reads under load. Not Veggie fuel pressure but Diesel fuel pressure. Trying to figure out if the DFA-BFT supplied 6.0 check valves are too restrictive or it is just coincidence that I have heard from 3 clients in the last several weeks with this problem of low diesel pressure under load. I think some bad CVs made it into the mix. YoungMT Hick is using a single Parker check valve after going through a bunch of failed CV's. Last edited by AzDave; 09-21-2017 at 08:27 PM. Thanks for the photo. What I am looking for is the installed photo. Where and how plumbed. Thanks,Dave. I asked YoungMT to chime in on this thread. Will respond more late but I am still running two check valves plus a Parker. My current fuelsystem in -8AN from the sump, to the AirDogII (Dont care to much for this pump, regulator isnt to good) From the ADII it goes it goes to just about the front cross memeber. Here is where the Parker Check valve pictured above is installed. Out of the Check valve it goes to a Y splittler. -8AN inlet and -6AN outlets. From there is two -6AN line that go straight to the heads. Turns out Honda has a Banjo that has the correct banjo size and -6AN outlets to thats what i used to install to the heads. I dont use the stock fuel bowl anymore. I did have to stack two copper washers on the base of the heads before the banjo bolts to space out the thickness of the hoses vice the standard metal tubing. 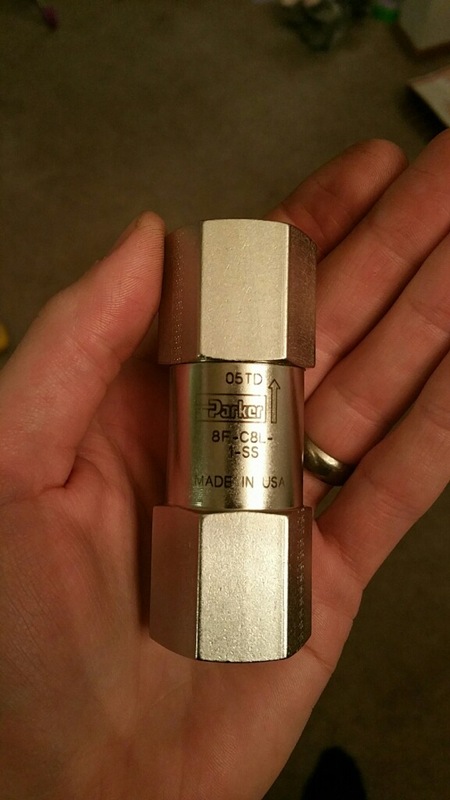 all is cased in parker pushlock hose. Return is rigged up a little from the ADII return line to a bunch of fitting to reduce down to the Factory return line. Needs fixed but works for now. So currently running three check valves. Problems are Diesel pressure is set at 55-60#. On WOT runs pressure drops out to 45#. So maybe replace the check valve in the front of the motor with different style fitting that adapt straight to a -6AN hose is the next plan and not run banjos. Recent trip from Bremerton, WA to Idaho Falls, ID I did notice about 2 gallon increase in my diesel tank (It was just above 3/4 right below the "F" and then over the trip got to middle of the "F") So now i have to drain out the diesel tank and throw that into my Veg Tank. Currently have my injectors out and am trying to clean them again. (Need to start doing it myself). Probably going to Warren's or maybe Matt will help me out and dirll out the screens too. I will get pictures later tonight once the kids are asleep. That check valve has a one pound cracking presure so maybe a checkvalve with a higher cracking pressure would help.